A bullish change of guard with strong and subtle bear traps…Will it sustain ?! The expected bullish move came yesterday and the move was equally powerful as the complete previous day’s bear candle has been turned into a bull candle. This pattern generally, if it happens at market’s low signifies a ‘change of guard’ and is a very powerful indicator of a bullish move. On the way up, there has been a very powerful bear trap at 4636 levels and this will play a very crucial role going forward. At any point in time, if bears conquer this level and reach 4606 then markets will be totally under bear’s grip for this entire series. The PCR is now at 1.04, which is again neutral and for the strong up move seen yesterday, it is likely to test further high levels of 4788 and even 4810 levels. Sustaining to these levels is more important for the uptrend to continue and one should wait and watch to see if that happens or bears take control again at the end of the day. As discussed yesterday, NIFTY made a powerful up move today and this is in continuation with the bear trap made on Friday the 13th. There was not even a pull back till 2695 levels and NIFTY also formed another strong bear trap at 2719 levels which also happens to be the previous close. A move till 2734, the then high and also a key resistance level was made and NIFTY took support at that level and went on a strong upmove till the next level of 2765 and also closed well above that level, closing above its 20 DMA after 15 sessions. A strong 3 white soldier pattern has been formed. The immediate next move will be towards 2810 where its 50 DMA resides currently. Any upmove beyond that can be retraced to the 50 DMA level sooner or later and so it may not favour both bulls and bears. Further resistance levels are 2845 and 2868. This short term rally will most probably be not able to move beyond 2868 and so short positions can be entered if it reaches that level. 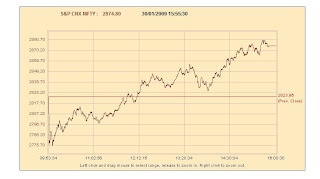 2734 will act as a good support level and NIFTY is unlikely to test that level. 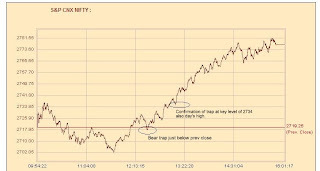 NIFTY – Bear trap on Friday the 13th Mar 2009. Will it continue? 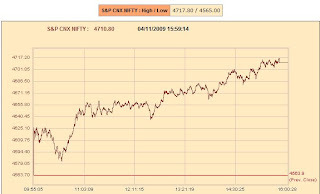 On friday the 13th, NIFTY made a surprising move to end up around 4% higher. The majority of the shorts created earlier and created at the open were waiting for an opportunity to exit and there were a few waiting to add new shorts as everyone felt there will be a pull back down to 2650 levels atleast. 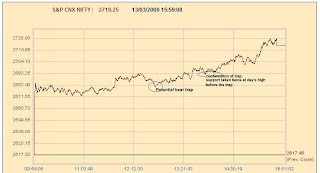 This was the prevailing sentiment and exactly at the time you can see NIFTY made a move from the then day’s high to 2682 levels which was also almost the opening price. It then moved up immediately and we could see that the move had trapped a few bears at that stage also. Then on reaching the day’s high around 2695 levels, there was again a pull back, but the moment that it broke 2695, all the bears were completely trapped and the rest is history. Given this scenario, there is a very strong possibility that on monday also this move will continue and it can retrace only till 2695 levels and further to 2682 levels and can then bounce to new levels. If on the contrary it breaks 2671 levels and move on to 2650 levels then that can be considered bearish rather than taking it as a move to trap more bears.